While it is not all that common for horses to go completely blind, it does happen. One of the most common causes of blindness in horses is as a consequence of chronic anterior uveitis, often referred to as moon blindness. Uveitis is a disease of the tissues (uvea) that make up the pupil of the eye. 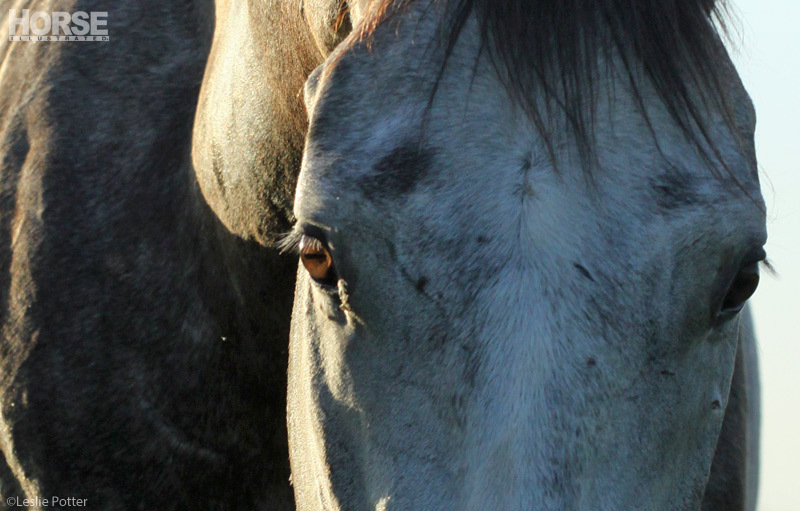 With chronic inflammation, the horse may develop a number of secondary problems within the eye: a) cataracts that reduce the opacity of the lens, or b) the eye can lose its fluid and pressure and much like a grape that dries out and shrivels to a raisin, so too, can the eye – this is called pthysis bulbi. Usually an eye with anterior uveitis is a painful eye and it is obvious that the horse is in distress. He will hold his eye squeezed shut, particularly in bright light. His eye may produce a lot of tears and/or the conjunctiva is red and inflamed. Another tip that a horse’s eye is painful comes from the eyelashes – instead of pointing outward, they point down. 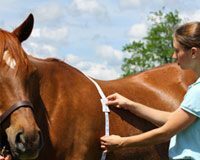 It is important to have your veterinarian examine a horse with a painful eye immediately to minimize the risk of other problems developing that potentially lead to blindness. In some cases, a horse may slowly go blind without you knowing. This is more common when the eye isn’t painful and so you have no way to measure what is going on in the eye, such as cataracts or the slow dissipation of the globe of the eye as it loses its normal fluid and pressure. Less commonly, a horse may develop cancer, like squamous cell carcinoma or lymphosarcoma within the eye tissues – some cancers may be aggressive enough to necessitate removal of the eye. On rare occasions, a horse may run into a solid wall or tree with his head with sufficient impact to elicit retinal degeneration that leads to blindness. What Signs Might You See? Just as you’d expect with reduced vision, you may notice that your horse bumps into doorways or rails as he is led from the stall or barn or through a gate, or that he tends to spook more often than usual, especially in low light areas. He may exhibit behavioral changes such as being more anxious and jumpy, or unusually stubborn about moving when led or ridden. As vision progressively fades, you may notice your horse tilting his head in odd positions in an effort to better move something into his field of remaining vision, or as a way of focusing his auditory senses. In less obvious cases of vision loss, one way to ascertain how well your horse sees is to set up an obstacle course in an arena or other safe location and securely blindfold one of your horse’s eyes. Then, lead him through the course and see if he continually runs into things on the non-blindfolded side. Switch the blindfold to the other eye and see if that changes anything. In addition, a veterinary examination of the eyes with specialized instruments can provide a wealth of information as to the health of internal eye structures. For any horse that is experiencing vision problems, it is important to house him in a safe environment in which he is familiar and can get around without entanglement or entrapment. Be cognizant of the horses he shares space with as he isn’t as able to get away or protect himself from even the most casual bullying. A herd situation isn’t the best idea as this presents him with too much for him to contend with – social ranking, food competition, to name a few situations. It is best to pair him up with a compatible companion horse with good eyes. Such a “seeing-eye horse guide” can help your vision-challenged horse navigate his living area, whether it is paddock or pasture. A completely blind horse will tag close to his friend and simply follow him wherever he goes. It may be helpful to place a bell on the companion horse initially while the blind horse adjusts to his new seeing-eye companion. And, your horse’s whiskers are an additional navigation tool for him to feel his way around his environment – don’t shave away those wonderful sensing hairs! Safe fencing is essential for horses with impaired vision – no barbed wire! – and there shouldn’t be any tight corners, debris, equipment, holes, ditches, trees or other obstacles where a blind horse might get trapped or injured. Put water sources and food in spacious and easily accessible locations and keep this routine the same from day to day. Not all blind horses can function safely in big living areas and may fare best in a small corral rather than a large pasture. This depends on the horse’s individual personality and how well he makes the adjustment to losing his sight. It is also your job as caretaker to advise other people about the blind horse so there are no sudden surprises that could startle or panic him. Post signs around the pasture and in the barnyard to alert others to the presence of a blind horse. You’ll need to be sensitive to the vision-challenged horse’s basic needs and personality. Don’t take it for granted that he can’t see you as you approach him. Your voice will alert him to your presence and location so you’ll want to babble to him so he has comfort in knowing where you are. Hands-on touch and physical contact are also reassuring. Caring for a blind horse is a commitment and takes a bit of common sense and patience. Developing a blind horse’s trust in you is paramount to giving him the confidence to maneuver in a darkened world. Is It Safe to Ride a Blind Horse? We have a horse with blue eyes. And he is definately going blind. Our vet keeps a close eye on them for us to make sure there is no infections or problems we can work on, but one other suggestion that has been helpful for our horse is a low wattage light at night to give him his bearings. We ran a small 4′ strand of white led christmas lights in the eve of the barn on a timer. They come on at dusk and off at dawn. They give a small glow, but we have noticed he can significantly find his openings easier. It just allows him to always know his directions. Also, we keep a fly mask on him during the day every day if it is not cloudy. I have even sewn a second layer of fly netting over some to add a little more shade. This helps too. The tilting of the head is something we really notice. Almost approaching us sideways. He also rubs his head and covers it in mud. Since he is white, we assume this is to cut down reflection – like the black marks under a football players eyes. Smart animals!! Great article! I have a blind Appaloosa. I keep her at a boarding stable we still let her outside. We just don’t put her in the paddock because the other horses were picking on her. I know every horse is different but she does just fine outside. We bring her in about every 2 hours to get a drink of water and to get out of the sun. We always keep her fly mask on while she is outside to keep sun and dirt out of her eyes. As for attention she really isn’t mine but I have been given permission to take care of her, because 5 months ago I started working at a stable and she was depressed and would hang her head. I just can’t believe what just a little attention dose.